It is truly an honor to be able to attend Quilt Market. The opportunity to meet artists, designers, creators, and all the companies that support the quilting industry is both inspiring and intimidating at the same time. 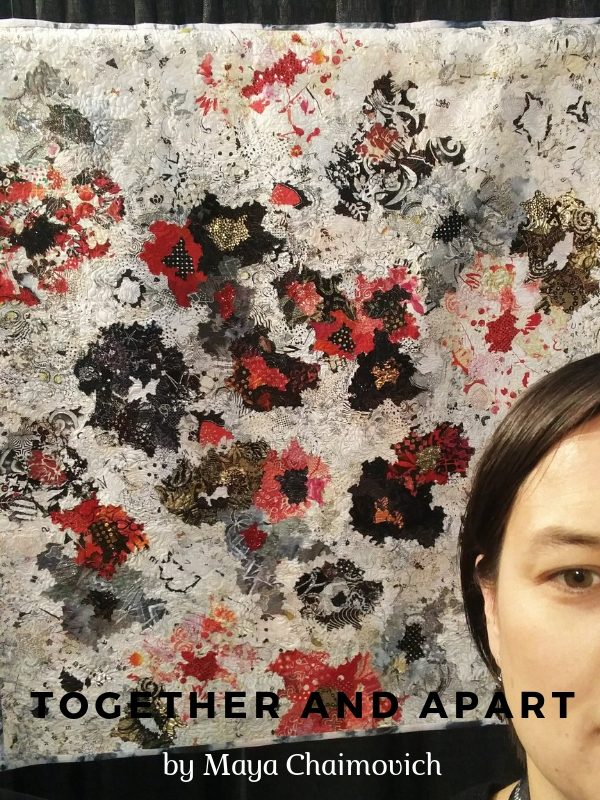 Although I have been part of the quilting family since I was a kid, being intimately connected to the industry is a whole new world. I met people that have seen my quilts and were so excited to get to meet me. I spoke with vendors who liked my work and wanted to work with me. It was a bit overwhelming. All in a good way. Market always reignites my passion for quilt designing and refuels my desire to continue to be part of this community. This year, was an extra new experience. I have attended Spring Market in years past but this is the first time I have attended Fall Market, which is always in Houston, TX and always precedes the International Quilt Festival and Show. There is no show in the spring, so this was an extra special treat. Following are some of my favorite quilts from the show. This quilt was part of a special exhibit called "Along the Road" featuring art quilts by Maya Chaimovich. She uses different types of materials, including recycled clothing. She says, "an important part of her design process is using clothing materials worn by people she doesn't know and giving them a life of their own." This quilt in particular expressed her happy, strange, and sometimes lonely moments. This quilt caught my attention, not only for the red and black, but for the intricate piecing. You don't make six of these in a year. In fact, you probably don't make even one. I hope this artist can celebrate the success of her beautiful creation. It's just stunning. Not everything at Quilt Market and Quilt Festival is a quilt. 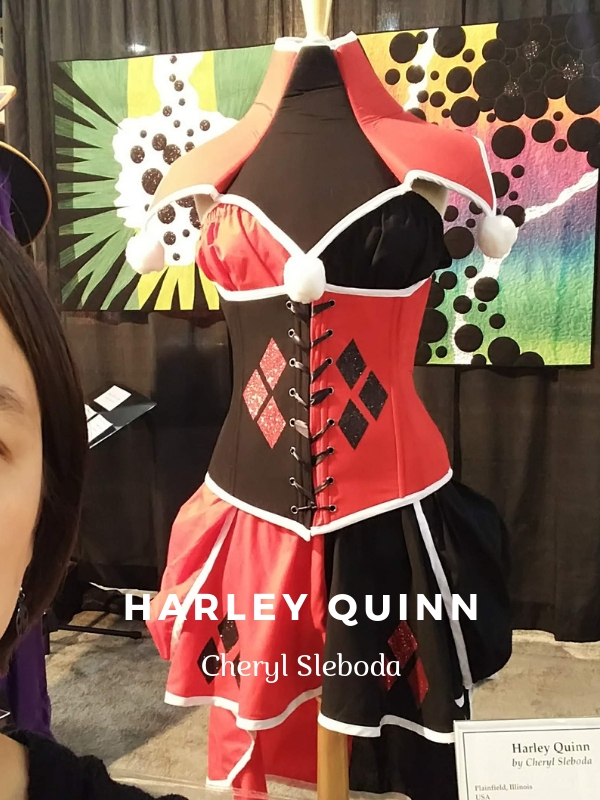 This amazing design, by Cheryl Sleboda of Sew Much Cosplay, was part of her special exhibit of Quilts and Cosplay. Not all quilts on display are of the latest technique or newest trend. Quilting is a celebration of old and new, traditional and modern, and everything in between. This quilt was inspired by a quilt on display at the Nova Museum in England, made in 1870. Are you sensing a theme? I hope so. One of my hopes for this market was to work on defining who I am as a quilter and designer. What makes me me? What is my brand. Well, my ladybug says a lot about me. The red and black with white is my distinguishing mark. Spread your wings and fly. You don't know what is possible until you try. Come along with me on this quilting journey. Who knows where we will go, but we will go together.